I’ve been eyeing the bumpy, brain-like fruit at my local coop, Kokua Market, for some time now. I would pick one up and weigh it in my hand. I knew the Hawaiian name was ‘ulu; the English name, breadfruit. But I didn’t know much more than that. 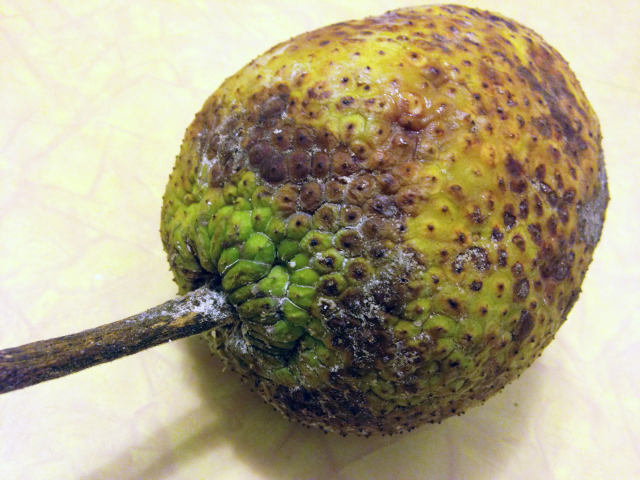 Not knowing what to make of its black spots and crusty scabs or how to tell it was ripe, let alone how to cook it, I would end up setting the ‘ulu back down. But last weekend, I finally bit the bullet. I put a small green breadfruit in my basket, took it home and put it on my counter where, at first, it just sat, green and mysterious. While it ripened over the course of the week, I poked my nose into library cookbooks, websites, and blogs, learning that ‘ulu, like the plantain, can be eaten firm and barely ripe, or soft, sweet and fragrant. The barely soft breadfruit can be prepared just like a potato. Or, the fruit can be allowed to ripen until creamy like custard, then baked with butter and sugar for desert. In Hawaii, they bake it in an imu, a traditional oven dug into the ground and fueled with banana leaves. 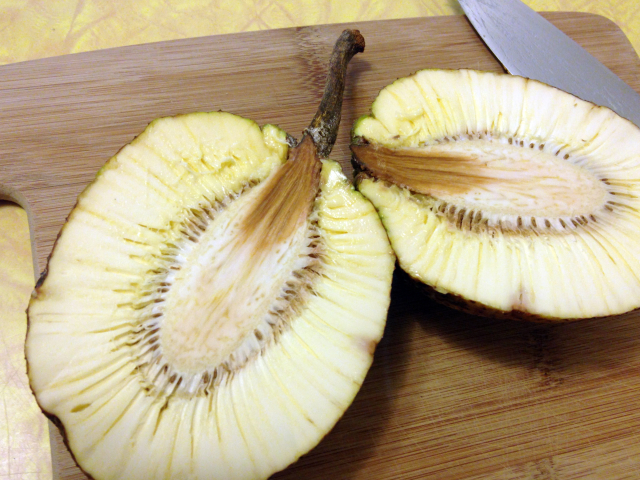 Tonight we cut into the breadfruit, which smelled surprisingly wonderful – a gentle, rich, pleasing smell. It was closer to the soft-and-sweet end of the ripening spectrum, but not gooey-sweet yet. So it was turned into little pancakes, suited for toppings both savory and sweet, inspired by Pamela Boyar’s recent recipe in the Star Advertiser (thanks Richard for the tip!). Now I will be seeking out the wonderful, elusive aroma of ‘ulu as often as I can. Core and peel the breadfruit. Cut into chunks and place in a blender or food processor. Add the eggs and salt. Pulse, scraping down sides as needed with a rubber spatula, until fairly smooth. Heat butter in a frying pan over medium heat. Make small pancakes and fry for a few minutes on each side until brown and set all the way through. Serve with a choice of papaya salsa and jam, and other sweet and savory toppings. Peel and seed papaya. Mince until broken down and juicy, then place in a bowl. Mince the onion and add to the bowl along with the chili flakes. Add lime juice to taste. You can also add cilantro to taste. If you are a breadfruit fan, please share your recipes with me. I will be sure to try them! This entry was posted in Blog and tagged food, hawaii, honolulu, recipe. Bookmark the permalink.